These are excerpts from the book published by The History Press, 2017. Millions of fans tie their identities to their football teams’ successes. Montanans, too, take football seriously at all levels, from Pop Warner to high school contests played under Friday night lights, to the raucous weekenders at the University of Montana and Montana State. Football is so rooted here we almost take it for granted. To scores of folks, football is family time or an escape from everyday life. Deeper still, there is a special pride Montanans hold when one of their own reaches the pinnacle of the sport and earns a spot in the National Football League. Indeed, sparse populations produce big loves, and to send someone to the biggest stage from the smallest of population centers is extraordinary. The franchise is often irrelevant, for Montanans will cheer on a kid from Cut Bank or Choteau or Missoula, no matter if he is a Denver Bronco, Seattle Seahawk or Carolina Panther. 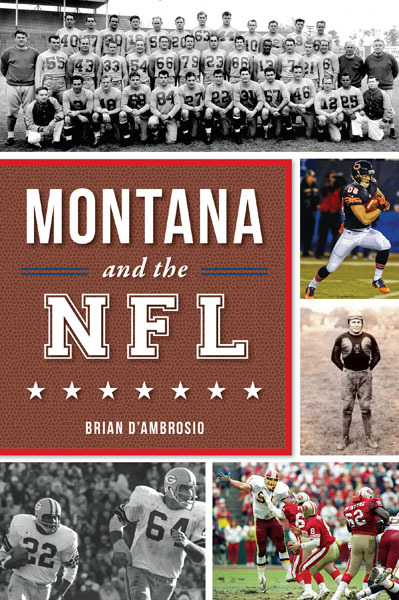 “It’s going to be a small book, I’m sure,” was the typical response from folks when I mentioned to them that I was researching and writing a book about Montana’s NFL connections. But that’s not the situation. Indeed, Montana’s connections to the NFL are extensive, including a player on the earliest Green Bay Packers team (Butte-born Jack McAuliffe), a player on the first San Francisco 49ers squad of 1964 (running back Earl “Pruney” Parsons, who was born in Helena), one on the first Oakland Raiders team of 1964 (guard Wayne Hawkins, born in Fort Peck) and one of the most dominant offensive linemen of the 1940s (Anaconda-born Francis Cope, who earned all-decade honors as a New York Giant). For purposes of concision, the book includes only players who were born in Montana, raised in Montana, or attended high school or college in Montana and then went on to play in the National Football League. Players who elected to settle in Montana after retirement are not included. Players from Montana who have gone on to establish themselves in the NFL lack any semblance of entitlement and take nothing for granted. Football has taught Montana kids to fight for what they want, and the sport has taken some talented, dedicated athletes further in life. Football has been good to them—and they have represented us through football. The profiles contained in this book emphasize the joys and struggles, challenges and hurdles, comforts and delights of reaching the NFL and representing the state of Montana at the highest level of the sport. The unpleasant truths haven’t been dodged in the conversations, and the book examines the hotbed controversies and persistent concerns surrounding the safety of current players and the responsibility of the league to assist former ones. Greater knowledge of head injuries and their effect on deceased stars such as Junior Seau forced a re-examination of the sport. Indeed, football is under assault because of its concussions, domestic violence, player discipline, Colin Kapernick’s political stance and the escalating perception of some that it’s too costly to watch and too dangerous to play. Still, there is an incredible number of people who love football and see it and its better values as timeless and universal. Perhaps they are more interested in the three hours of action of the game itself than thorny issues of player safety, activism and misbehavior—all will, ultimately, be forgiven. The sport faced a crisis in 1905, when at least eighteen people died while playing. President Theodore Roosevelt stepped in, encouraging safety changes and the forward pass. There’s no reason to think the NFL won’t adapt and sustain itself in time for its one-hundredth season in 2019. If the product endures and if the country’s most popular league expands, perhaps the time will come when the state of Montana hosts a National Football League team. Crazier things have happened in the history of league expansion. In fact, when NFL owners voted in 2016 to move the Rams back to Los Angeles, Newsweek opined that “they fumbled their chance to create a small-market behemoth akin to the one in Green Bay.” The magazine’s alternative market selection: Billings, the largest city in Montana. It reasoned that the town of Green Bay, Wisconsin, “home to the most devoted fans in the NFL and approximately 105,000 people,” attracts its spectators from the city of Milwaukee and all through Wisconsin. Billings, with a similarly sized population of about 109,000, could theoretically lure supporters from throughout the Treasure State as well as its four boundary states (Idaho, North Dakota, South Dakota and Wyoming), none of which are home to an NFL franchise. Sweet dreaming? Perhaps. But until that time arrives, Montana football fans will continue to derive gratification from the sight of seeing one of its home-grown high school kids or college stars run, throw and tackle in an NFL uniform. Any NFL uniform will be adequate.